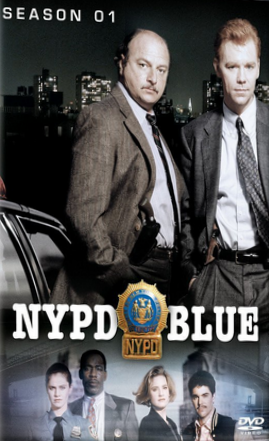 Titled as Pilot, first episode of NYPD Blue – a police procedural crime drama, is focused on introducing us to main characters of the TV Show. Without wasting any time in formal introduction, the episode comes to the point directly. It nicely introduce us with the prime characters through their actions. The title sequence is interesting. The background music of the title sequence sets the mood for what is coming. Overall the DVD quality is good. The TV series is originally filmed decades ago, but the remastered print is in good video and audio quality. The director got full chance to portray NYPD and city of New York on celluloid. And the camera team seems enjoying the challenge. Various areas of the city are portrayed really well. Running with fast pace, the episode starts with a court-room drama going on. Here we see a hearing about the actions of – Andy Sipowicz (played by: Dennis Franz) – an NYPD detective – is going on. This scene is filmed nicely. We are also introduced (only visually) with the character of John Kelly (played by: David Caruso), in this scene. The dialogs in the scene are sharp and straight forward. By the way, the thing didn’t went well for Andy as the criminal was declared “charge free”. The scene filmed outside the court shows us the hot-tempered nature of Andy. We also see that he is foul-mouth in a way. His partner Kelly however works with better temperament. We also see that Andy is alcoholic. When he is in bad mood, he drinks too much and gets out of control. When his partner Kelly tried to advise him and take care of him, he rather scolds him. This conversation also tells us that the things between Kelly and his wife are not well. The following scene tells us that Kelly’s wife have already filed for a divorce with him! Out of control Andy goes to the restaurant where the “charge free” criminal was enjoying with his group. He creates a scene there and at the end of the scene he was sent to his home by Kelly. Of course the things didn’t prove to be any good for him as his department also takes action against him. He was needed to surrender his badge/shield and gun! What happens to him now? Will the goon came behind him to take revenge? Will he be overpower the shady characters without a gun? Will he reconcile with Kelly? Will the things between Kelly and his wife going to be smoother? The New York city of 90s is explored nicely and we enjoy exploring it via various scenes of this episode. The episode shows a lot of NYPD cars and often gives feelings of watching a movie. The wardrobe is chosen nicely. Though this is the pilot episode we are still waiting to get introduced to more characters and proper thrilling components falling in place, but whatever we had seen so far is quite good. The episode explores that the police officials are also human beings like us. Their odd job hours and tensed life lead them to sacrifice (at least a part of) their social/family life. Also, they tends to develop personal problem with shady characters which often come after them when they are stripped of the power. Still the people from armed forces, police department, investigation agencies, etc… works hard to make the society a better place to live. (Of course exceptions are there, but they are there in almost every area). They have their own problems and often they become very fragile, emotionally. We are not exploring the episode content in very detail to keep your interest intact when you watch it. It is nominated for – Primetime Emmy Award for Outstanding Writing for a Drama Series. It is also nominated for – Primetime Emmy Award for Outstanding Directing for a Drama Series. Watching this episode requires parental guidance. Having used some offensive language, adult scenes and violence, makes it – not to go for – for underaged audience. A nicely written, running at fast pace, thrilling and gripping episode, a good choice for crime drama and thriller lovers. Is crime drama your cup of tea? Are you going to watch this TV series? Do share your thoughts via comments below. And yes, if you like this article, don’t forget to share it with your friends and loved ones over various social networks.